Yes, the rumors are true – Manor College is launching TWO bachelor degree programs this Fall and we can’t wait to tell you more! 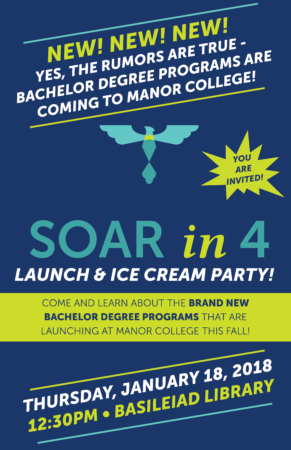 All are invited to join the Manor College community for Soar in 4: Launch and Ice Cream Party on Thursday, January 18, 2018 at 12:30pm. Come out to the Basileiad Library on Thursday, January 18, 2018 at 12:30pm. Want more information about Bachelor degree programs at Manor? Fill out this form!